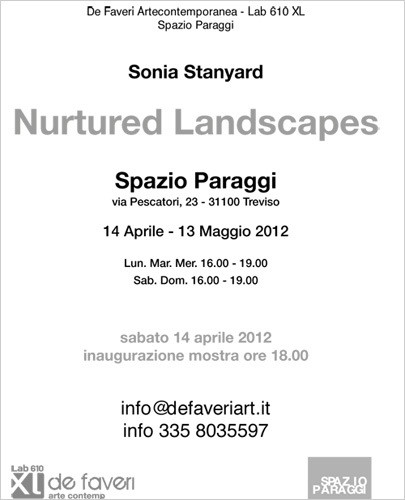 “Nurtured Landscape” runs from the 14th April to 13th May 2012. By Kristy Gosling, Fine Art Photographer. Initially these works appear to be first and foremost engaged with process, and almost incidentally referencing nature and the landscape. That is not to say that they are un-considered as there exists in all these pieces thoughtfulness played out through beautifully muted palettes and a depth of field which is surprisingly photographic. More that, inherent in these works is a playfulness, an innocent experimentation with the medium, as though the forms exist primarily to draw parallels between the way that paint behaves in response to forces such as gravity or liquidity and for example the manner in which a tree grows, or a mist moves over lowlands. Then comes the realisation that these paintings operate in a unique space between realism and abstraction, there is a curious dualism here, any hints of realism are immediately denied, undermined by brave and sweeping revelations of the mediums characteristics, dripping paint or brushstrokes in a background wash. There is an unmistakable essence of the self-consciousness of the artist about them, which can be perceived as modesty, honesty. The motives for this kind of work are naturally complex and deeply personal and it is perhaps eloquent that peripheries and inaccessible places feature frequently. ...Subtle and delicate shifts of colour, calm expanses of reflected light or deeply glowing twilight atmospheres, characterise Stanyard’s moving and quietly contemplative landscape paintings. Reference points in the landscape, a tree, a bridge, a window, are caught between materialising and dissolving, and precise detail and definition melt away into diffusion. These veiled visions that float as if in a dream might be seen as melancholic, but in this stillness a profoundly poetic, optimistic connection with both the power and the fragility of the natural world is made. Far more than specific identifiable places, these softly evocative landscapes emerge out of a composite of Stanyard’s experiences. Violet Lodge for example refers to her travels in 2007 through vast and deserted American landscapes, finding abandoned semi-derelict cabins in the woods that inspired a variety of ambiguous interpretations: forlorn, secret, magical. The weathered peeling surfaces of these rudimentary structures opened up numerous painterly possibilities. Stanyard has worked from this subject several times but this latest version is full of a new spirit of discovery, as if familiarity with the motif has allowed her to enrich and revitalise the painting process. In Colony the misted, mountainous space is accented by a lush, almost Amazonian, section in the lower right of the painting; Stanyard was reading Joseph Conrad’s Heart of Darkness at the time and the title of the painting references this trajectory of influence. A more constant motivating force throughout her work comes from the sublime qualities in Russian and Scandinavian art and the Romanticism of Caspar David Freidrich, as well as from the expressive power of abstraction, Mark Rothko in particular. 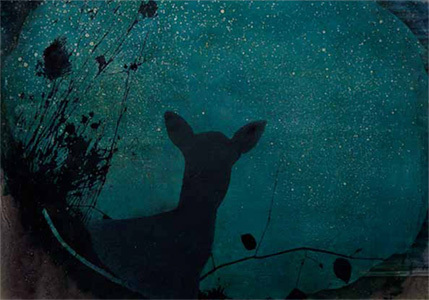 Sonia Stanyard and Amy Albright runs 16 March – 09 April at Artwave West Gallery, Morcombelake, Dorset, DT6 6DY. Telephone: +44 (0) 1297 489746. Open Wednesday-Saturday 10am – 4pm and at other times by appointment. Sonia Stanyard, born 1973, Yorkshire. Lives and works in London.